The death toll in the violence that followed the killing of Burhan Wani has mounted to 39 while 3,140 persons including 1,500 security personnel have been injured. One person was today killed in clashes between security personnel and protesters who attacked a police post in Kupwara as protests were held in some parts of the curfew-bound Valley where 39 persons have died and over 3,100 left injured in the violence since last week. A mob attacked a police post at Hatmulla in north Kashmir’s Kupwara district Saturday afternoon following which the security personnel retaliated. One person was killed and two injured in the incident, a police official said. With this the death toll in the violence that followed the killing of Hizbul Mujahideen commander Burhan Wani has mounted to 39 while 3,140 persons including 1,500 security personnel have been injured. Minor protests were reported from some parts of the Valley but the miscreants were chased away by security personnel who resorted to baton charge, the official said. 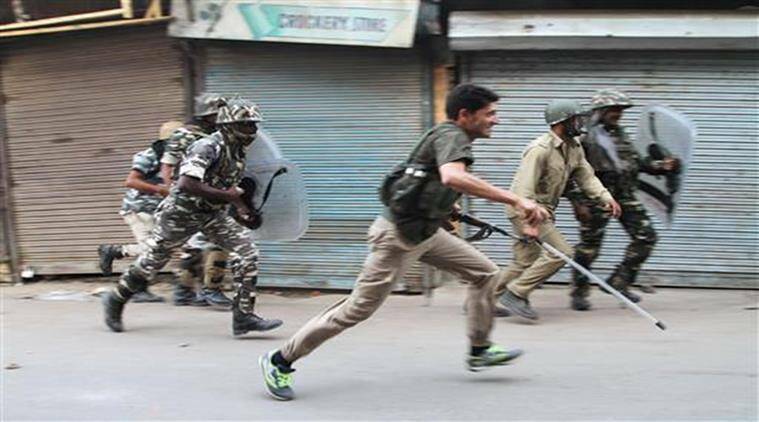 “The situation across Kashmir Valley today remained relatively peaceful. No major incident was reported from anywhere in the Valley,” he said. Authorities prevented newspapers from hitting the stands on Saturday as some media houses claimed that police raided their printing presses Friday night and seized the material while cable TV services were also affected in most parts of the Valley. The police official said curfew remained in force in all 10 districts of the Valley as a precautionary measure to maintain law and order. He said the decision to continue the curfew was taken in view of large number of stone-pelting incidents across the Valley yesterday. Two persons were killed and 23 others, including 9 securitymen, injured in the violence yesterday as mobs indulged in stone-pelting after defying curfew in many parts, while a police station was attacked with a grenade and firing by suspected militants from amidst the crowd of protesters. Mobile telephone services in the Valley also remained suspended to prevent any rumour-mongering. “Only postpaid connections of BSNL are working,” the official said. All telephone services including landlines were not functioning in Kupwara district today. Mobile Internet services continued to remain suspended for the seventh day today while trains are also off the tracks in the Valley. Greater Kashmir, the leading English daily published from the Valley, alleged that police arrested Printing Press foreman Biju Chaudary and two other employees. “The policemen seized the plates of Greater Kashmir and more than 50,000 printed copies of Kashmir Uzma and closed down the GKC printing press,” the paper claimed.